Direct-uptake Boron liquid fertilizer, particularly effective even in cases of severe nutrient deficiencies. It contains a high concentration of Boron 10% in a highly bioavailable form, making it highly effective even in cases of severe boron deficiencies. Boron 10% is suitable for crops with high Boron requirements, such as beets, vines, olives, cauliflowers etc. or for crop stages requiring an immediate uptake of high Boron quantities. 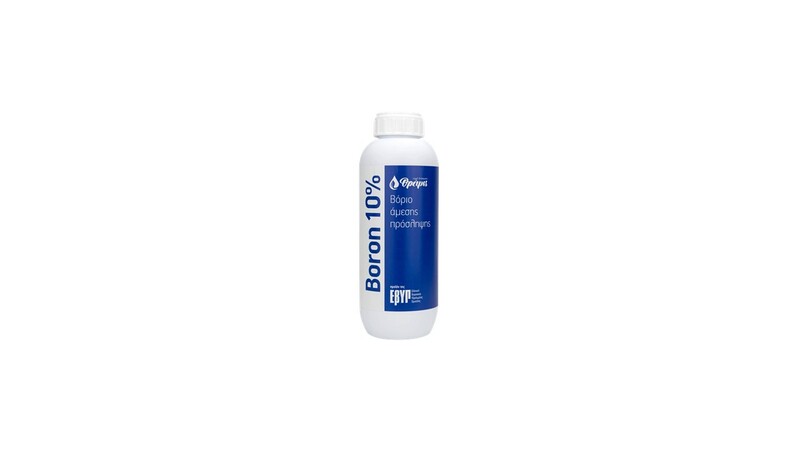 Boron 10% is suitable for application as a foliar spray and with fertigation. General dosage: 1-1.5 It / 1000 m2 through the irrigation system, or 100-200 ml / 100 lt spray solution. Olive trees: 1-2 foliar applications, with the 1st application at the beginning of flowering (inflorescence stage) using 100-150 ml / 100 It water and the 2nd application after fruit set. Vines: 1st application before flowering using 100-150 ml / 100 It water and a 2nd application after fruit set, at the same dosage. Stone fruits (e.g. apricot, peach, plum): Applications at the end of flowering and after petals fall, using 100-150 ml/ 100 It water. Apples, Pears: Applications at the end of flowering and after petals fall, using 100-200 ml/ 100 It water. Tomatoes, Cucumbers: Application before the setting of each cross using 100-150 ml / 100 It water. Leafy vegetables (Cauliflower, Cabbage, Broccoli): 1st application as soon as plants acquire enough foliage to absorb the product, using 100-200 ml / 100 It water. Repeat application after 10-15 days, at the same dosage.